Solid Gold Northland is headed to the 2014 show- this is one of our favorite events of the year! Everything dogs and lots of them. We invite you to stop and see us at our booth and get your pet food and nutrition questions answered. 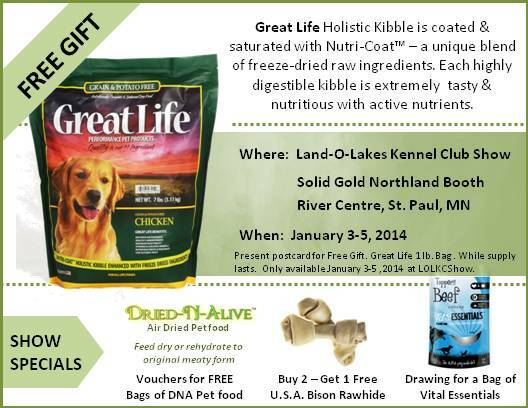 Along with all our awesome products, we will be introducing the award winning Great Life Dog Food. Print the Free Gift image and stop and see us at show. Your favorite dog will be happy your did. Can’t Make it to the Show? Click for savings coupon. Friday, January 3 – 8 a.m. – 7 p.m.
Saturday, January 4 – 8 a.m. – 6 p.m.
Sunday, January 5 – 8 a.m. – 5:30 p.m.
Tickets are available through Ticketmaster or at the door. More than 2,000 purebred canines – from big to small, hunting to herding, working and terrier, and even lap dogs – will compete for American Kennel Club (AKC) awards when Land O’Lakes Kennel Club presents its annual dog show at Saint Paul River Centre from Friday – Sunday, January 3-5. Obedience and Rally competitions will take place on Friday, Saturday and Sunday in addition to over 155 breeds of dogs competing for the honor of “Best in Show.” Judging schedules will be posted the week prior at www.onofrio.com. The Midwest Region Top Junior Handler competition set for Saturday will be a weekend highlight with some of the best in the region exhibiting their dogs. Junior showmanship is for handlers under the age of 18 who live and compete in a 15-state region, including Minnesota. More than 70 vendors will showcase the hottest trends in canine apparel and accessories, quality dog supplies, collectibles and artwork. The American Kennel Club will provide information on everything about dogs, including help in identifying breeds that are compatible with different personalities and lifestyles. Behind-the-scenes tours of the show will be offered every hour from 10 a.m. – 2 p.m. on Saturday and Sunday, free with the price of admission. Dog-related goodie bags will be given to all children on the tour. Parking: Attendees are encouraged to park in the RiverCentre parking ramp which is located on Kellogg Boulevard and offers skyway access to Saint Paul RiverCentre and Roy Wilkins Auditorium. Click here for a map to this convenient parking lot.